Sunscreen is a bit of a skincare conundrum: On one hand, it’s the single most important thing you can put on your face and body to prevent sunburns, skin cancer and premature aging. But on the other hand, it can cast a white, thick or greasy layer on your face and instill fears that toxins within the formula will absorb into your skin and therefore the bloodstream, raising health concerns such as hormone disruption or even furthering skin damage. (Note: Said fear is valid, according to many experts.) You just can’t win—that is, until some ingenious researchers got their hands all over it. Yale University scientists have potentially created the perfect solution: an effective sunscreen that doesn’t penetrate into the skin’s layers, doesn’t rub off and applies transparently. 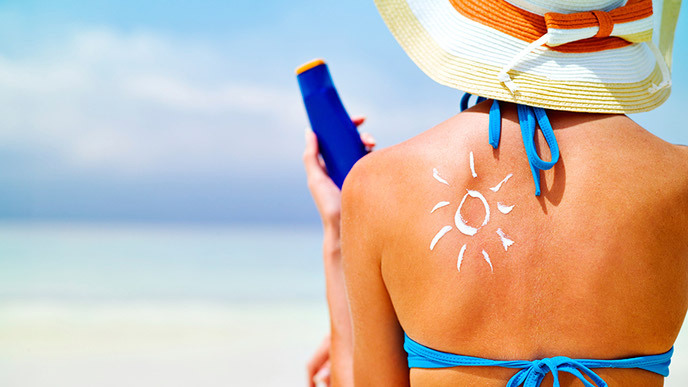 Their findings were published in the journal Nature Materials, where researchers describe this new sunscreen as being equally as effective against sunburn as commercial sunscreens (even when less is used). The stars of this new sunscreen are “bioadhesive nanoparticles,” which are tiny elements that stick to the skin’s surface. The study’s senior author Mark Saltzman, professor of biomedical engineering at Yale University, said in a news release, “Nanoparticles are large enough to keep from going through the skin’s surface, and our nanoparticles are so adhesive that they don’t even go into hair follicles, which are relatively open.” Even though zinc oxide and titanium dioxide—two of the most widely used sunscreen ingredients—work the same way, they’re typically paired with a chemical (i.e. perhaps toxic) ingredient or leave an undesirable white mask on the face. The researchers have not yet announced any partnerships with cosmetic companies to develop this new sunscreen. If it does come to market, would you try it out?